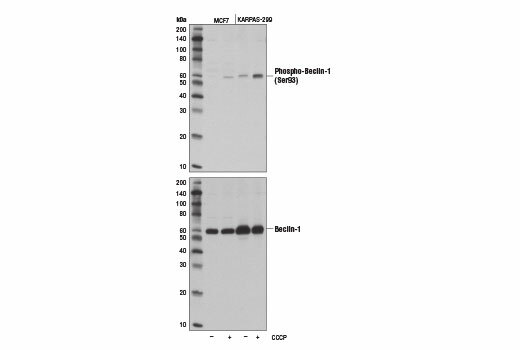 Western blot analysis of extracts from MCF7 and KARPAS-299 cells, untreated (-) or treated with carbonyl cyanide 3-chlorophenylhdrazone (CCCP, 100 μM, 2 hr; +), using Phospho-Beclin-1 (Ser93) (D9A5G) Rabbit mAb (upper) and Beclin-1 (D40C5) Rabbit mAb #3495 (lower). Cell line source: Dr Abraham Karpas at the University of Cambridge. Western blot analysis of extracts from 293T cells, untreated (-) or treated with carbonyl cyanide 3-chlorophenylhydrazone (CCCP, 100 μM, 2 hr; +) and mock transfected (-) or transfected with a construct expressing full-length human Beclin-1 (hBeclin-1; +), using Phospho-Beclin-1 (Ser93) (D9A5G) Rabbit mAb (upper) and Beclin-1 (D40C5) Rabbit mAb #3495 (lower). Immunoprecipitation of phospho-Beclin-1 (Ser93) from carbonyl cyanide 3-chlorophenyldydrazone (CCCP)-treated KARPAS-299 cells (100 μM, 2 hr) using Rabbit (DA1E) mAb IgG XP® Isotype Control #3900 (lane 2) or Phospho-Beclin-1 (Ser93) (D9A5G) Rabbit mAb (lane 3). Lane 1 is 10% input. 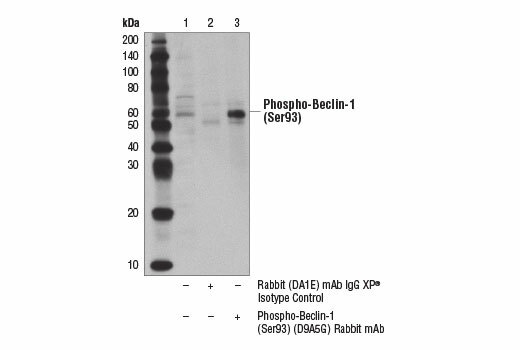 Western blot was performed using Phospho-Beclin-1 (Ser93) (D9A5G) Rabbit mAb. Mouse Anti-rabbit IgG (Conformation Specific) (L27A9) mAb #3678 was used as a secondary antibody to avoid cross reactivity with IgG heavy chain. Cell line source: Dr Abraham Karpas at the University of Cambridge. 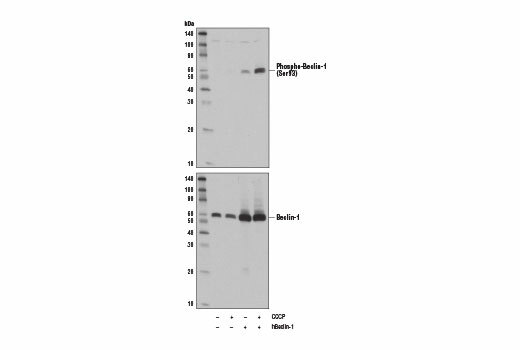 Phospho-Beclin-1 (Ser93) (D9A5G) Rabbit mAb recognizes endogenous levels of Beclin-1 protein only when phosphorylated at Ser93. This antibody recognizes single phosphorylation of Ser93 to a greater extent than dual phosphorylation at Ser93 and Ser96. This antibody may also weakly detect an unidentified band at approximately 70 kDa. Monoclonal antibody is produced by immunizing animals with a synthetic phosphopeptide corresponding to residues surrounding Ser93 of human Beclin-1 protein (Ser91 in mouse). To induce autophagy, AMP-activated protein kinase (AMPK) directly phosphorylates Beclin-1 at conserved Ser93 and Ser96 residues in human, which correspond to murine Ser91 and Ser94 (8).